You can see pictures of these finishes by clicking here. 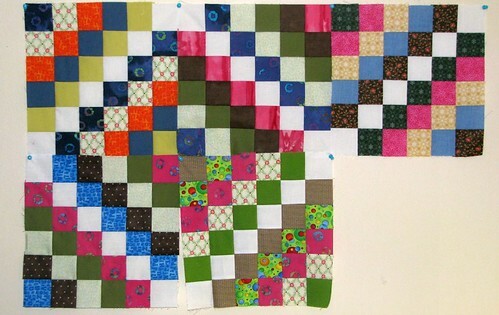 I also got caught up with the Fat Quarter Shop Designer Mystery BOM, completed the 2010 FQS Designer Mystery BOM top, got started with the Starburst Quilt Along over at Happy Quilting and made 12 Scrappy Tripalong blocks. Quilt Daisy Chains - I made this top a long time ago with mediocre quality strips in solids and a firefly print. I can see that my piecing skills have gotten a lot better since this top was made - the seams in this quilt don't match up in a lot of places! But I like the colours and it's perfect for my daughter's room in the city. So this month, it is getting quilted. In fact, I'm making this my ONE finish for A Lovely Year of Finishes. Piece block 9 of the FQS Designer Mystery BOM. Complete the Starburst top in time to participate in the linky party at the beginning of March. Piece rows 1 to 4 of Lori's Row Along (yes - I'm super late getting on this one!). And what do you have planned for this month? Introducing Reveille... all dressed in pink and red! 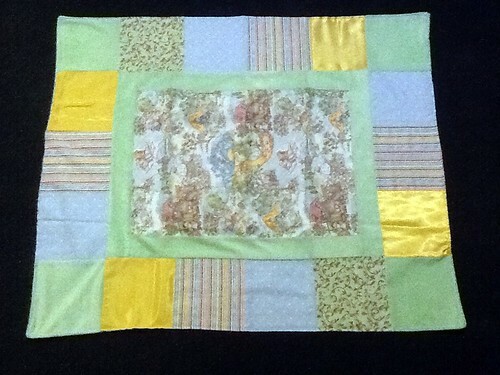 I quilted in the ditch around each block and along the borders. And then I used a squiggly stitch and stitched in the outer border. I really like this squiggly thing! Oh and I got some really good news yesterday... 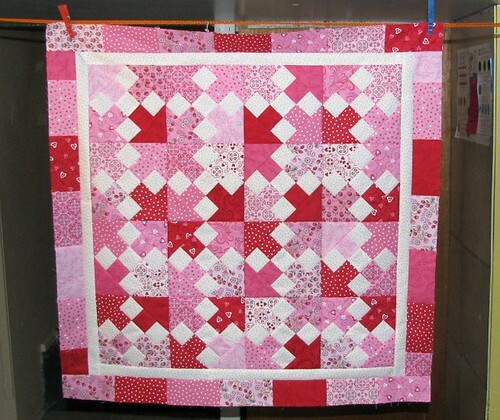 I won the weekly prize at Happy Quilting in the Starburst Quilt Along linky party! $25 to spend at the Fat Quarter Shop... how cool is that! 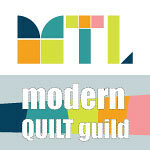 Will be linking up at Freemotion by the River, Quilt Story and Crazy Mom Quilts. This weekend was all about cleaning up and catching up for me. I made a decision a while ago that I didn't want to keep bringing rulers, iron and rotary cutters back and forth between the city and the country so I came up with a system. I piece in the city and I quilt in the country. So this weekend, I went through all of my fabric and packed everything I would need for piecing. 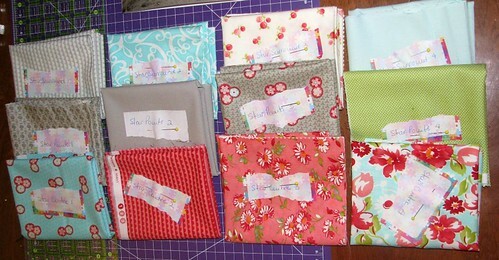 In the process, I discovered fabric I ordered forever ago for specific projects and never used. In fact, I found packages for at least 3 quilt tops! Am I the only one who does that? I also discovered I need to get more batting and I MUST stop buying books! I have enough quilting books in my sewing room in the country to make quilts for the rest of my life and never make the same one twice! I also found this little blanket in a pile of fabric. I made this little blanket from a kit I purchased at JoAnn's about 4 years ago. Making this baby blanket is what made me want to learn how to quilt! Once I got back to the city, I got started on a little catching up. 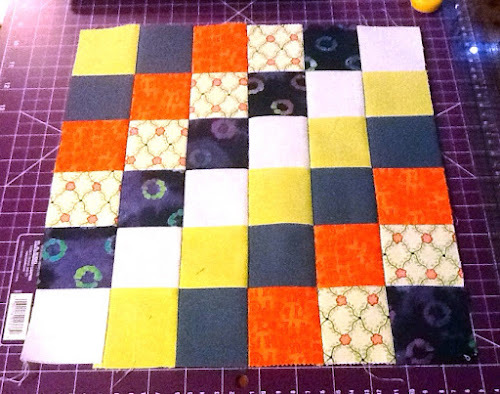 First, I pieced block number 8 of the Fat Quarter Shop Designer Mystery BOM. 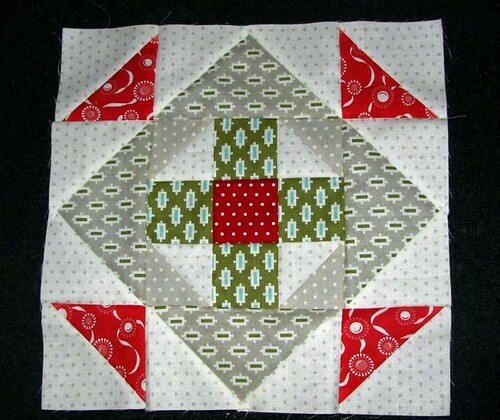 This block is called Lime Sherbet and was designed by Bonnie Olaveson and Camille Roskelley. 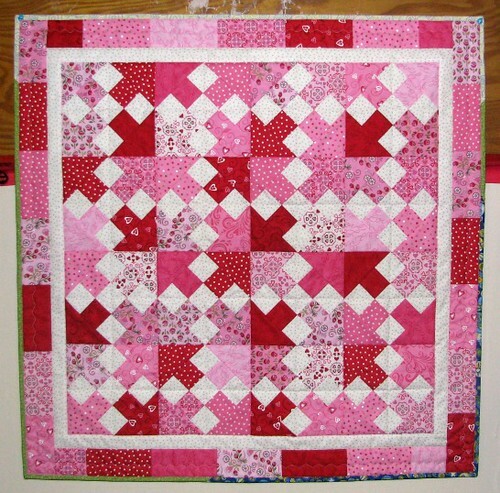 Then, I really needed to get going on the Starburst Quilt Along piecing because the linky party is tomorrow. 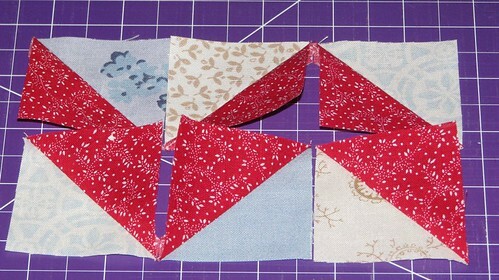 This week's assignment was 16 Goose in the Corner blocks and 64 HSTs. I will be linking up at Sinta's for BOM Rehab and Melissa's for the Starburst Quilt Along. 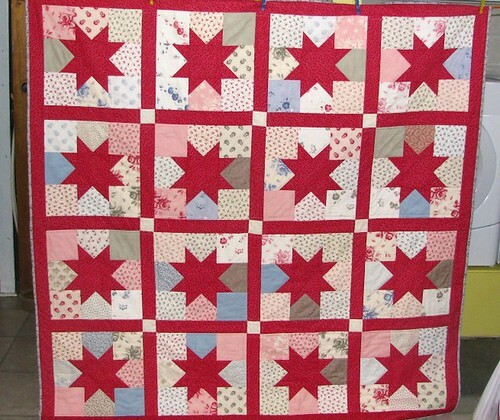 Here is Charming Stars... quilted and washed and ready to go! The pattern is from the Moda Bake Shop and was designed by Stephanie from Little Lady Patchwork (littleladypatchwork.blogspot.com). It finishes at about 65 inches square. I used 3 Northcott Range charm packs and the red is from my stash (don't remember where I got it). 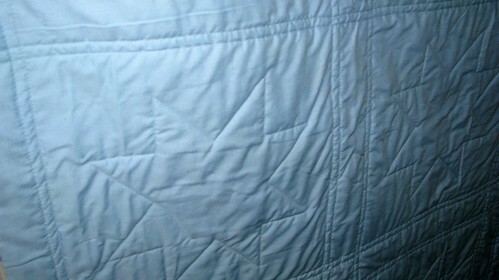 I quilted in the ditch along the sashing and then next to each seam using my walking foot as a guide. I then outlined each star using my FMQ foot. For the back, I purchased a blue cotton sheet and used a blue floral print for the binding. Almost as soon as it was finished and out of the dryer, it was delivered to my beautiful daughter-in-law. And another checkmark on the To Do List! 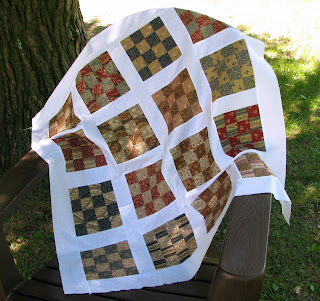 Linking up at Crazy Mom Quilts for Finish It Up Friday. Have a wonderful weekend everyone and thank you so much for visiting. 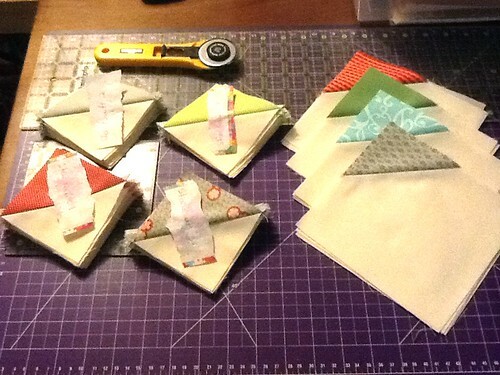 I dug out a huge stack of triangle clippings from the Charming Stars quilt blocks and started sewing HSTs! 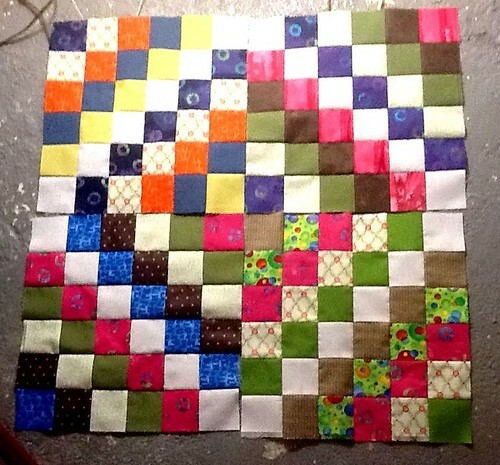 They are 2" squares so they will finish at 1.5" when sewn together. I plan on making myself a really cool chevron or zigzag pillow with these. It has not been all play however... 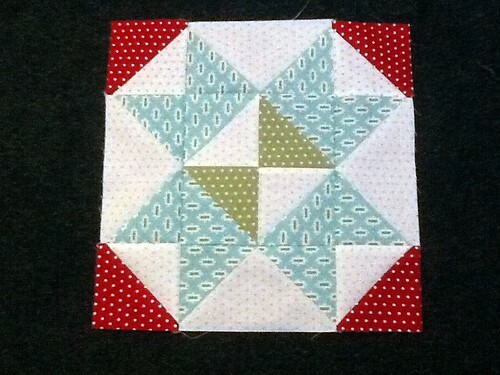 I did manage to get Charming Stars all quilted and finished putting the binding on last night. Photos to come in a future post. And what have you all been up to? 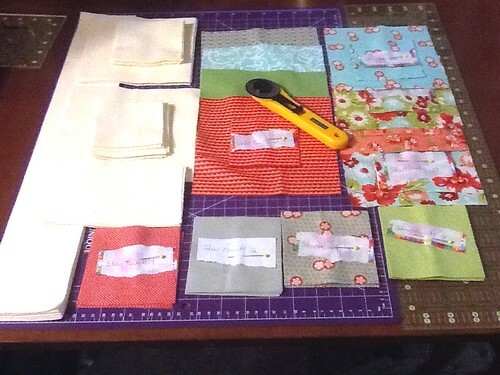 I finally got some time to cut the fabric I chose for the Starburst Quilt Along today. The background fabric I ordered hasn't arrived yet so I ended up going to Fabricville and getting some there. I'm making the smaller version so I'll have lots of leftover fabric from the fat quarters and will probably use that for a scrappy binding. If you are still debating whether or not to join us, it's not too late. You can get all the information here. I have been busy getting some stuff done this week and with all of the wonderful inspiration all over blogland, my head is spinning with new quilt ideas and projects I want to get started on. Does this happen to you also? You make this great list of projects you want to work on for the year, the month, the week and then you start reading blog posts and all of the sudden, those beautiful plans you made are all out the window? This happened to me this week when I was reading Melissa's blog at Happy Quilting. 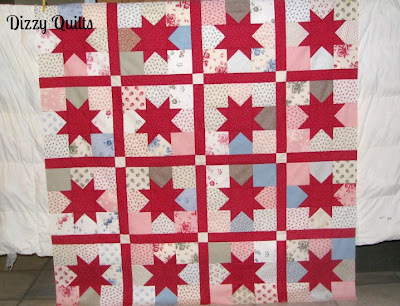 Melissa is hosting a quilt along during which we will all be piecing and quilting her wonderful pattern Starburst. This quilt is so stunning, I just could not resist. So I pulled out 12 fat quarters, but then realized I wouldn't have enough of the background fabric I want to use so I had to order some. 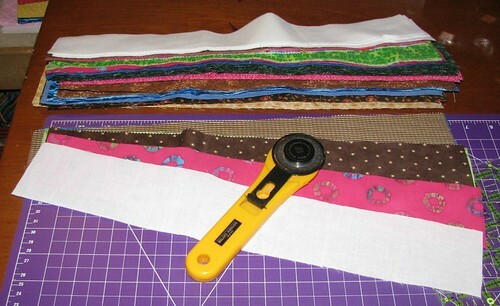 I hope it comes this week so I can get started on cutting and participate in Monday's linky party. 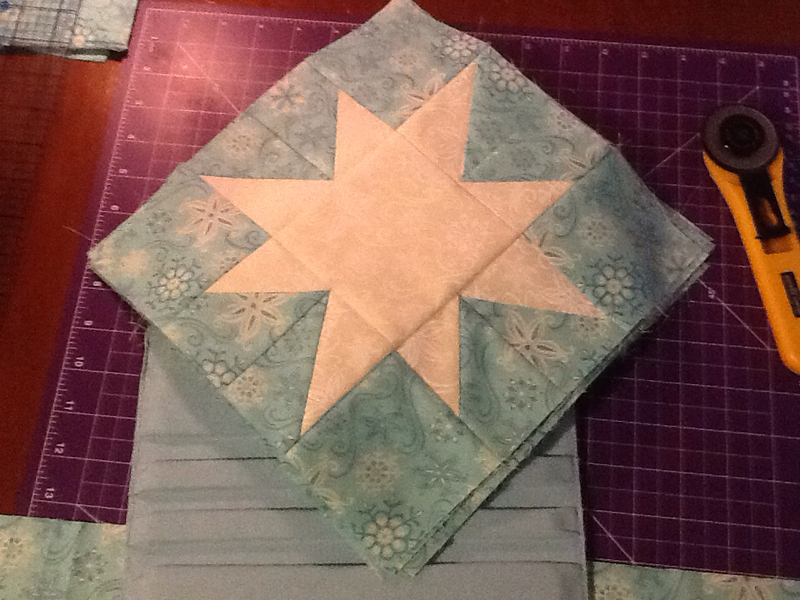 This week, I also got started on quilting Charming Stars and made some pretty good progress. I think I'll be able to get that one finished over the weekend. 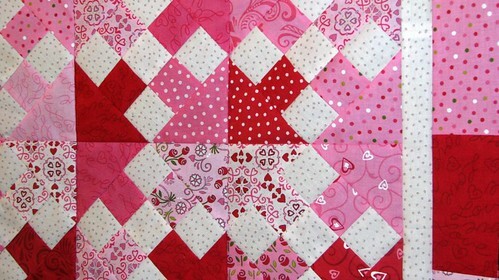 With Valentine's Day coming soon, I thought it would be fun to make a small red and pink quilt. And to kill two birds with one stone, I pulled out my Schnibbles patterns (we have to make our "favourite" Schnibble for the Feb 1 parade). Reveille designed by Carrie Nelson. Fabric: Always & Forever by Deb Strain for Moda. I should be able to get that little project quilted in time for the parade. A close up of the cute blocks! 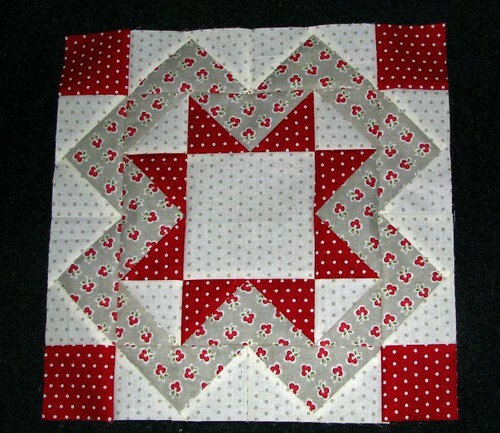 I went with a red binding (all leftovers from other quilts - gotta love that!). I have to say I'm really liking red binding. 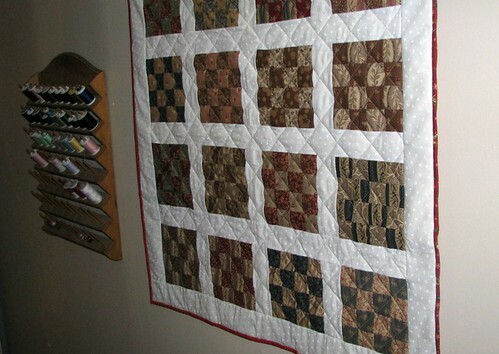 For the quilting, I chose an off-white thread and quilted a diagonal grid (approx. 2 inches). And I used a high loft polyester batting - I like the puffiness very much! It is hanging on my sewing room wall for the moment and looking at it while I work makes me incredibly happy! 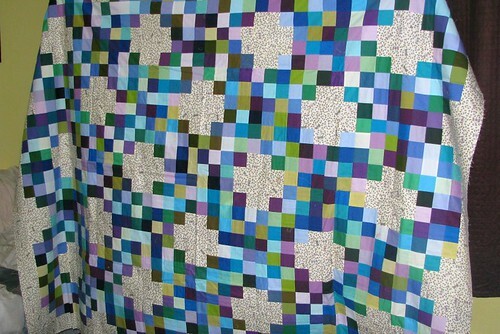 Finishing this quilt also means I've achieved my goal for A Lovely Year of Finishes this month - how great is that? And I get to put a checkmark next to my 1st goal for the Finish Along. Now moving onto Charming Stars. I decided to go the lazy easy economical way and purchased a cotton flat sheet on sale to back Charming Stars. I will start quilting it this weekend. Linking up at AmandaJean's for Finish It up Friday, at From Blank Pages for TTIFF will also be linking up for A Lovely Year of Finishes at the end of the month. Thank you for visiting. I hope you all have a wonderful weekend! Happy Hump Day everyone! It was back at work for me on Monday and after 1 1/2 day, my stress level was back up to where it was before I left for my 2-week vacation... not good. Thank goodness for my little sewing room! Spending time in there in the evening has kept me sane. So what have I been up to since last Wednesday? Well, I made some progress on a really old UFO, I finished a couple of things and I got started on a new project. 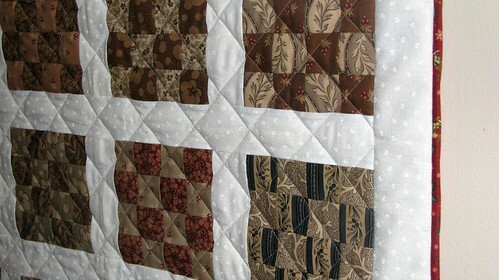 First, I finished putting together the top of the 2010 FQS Designer Mystery BOM and got caught up with the 2012 blocks. You can see pictures of those here. 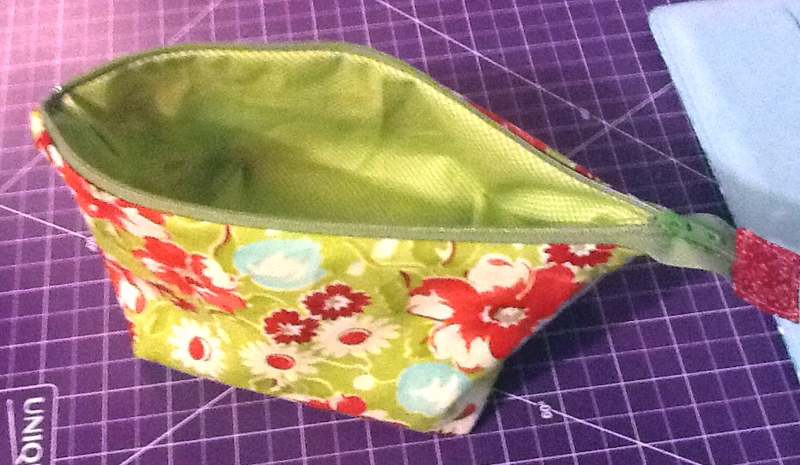 Then I made a couple of the Wide Open Zipper Pouches for my girls. I blogged about those here. I also worked on my goals for the 1st quarter of 2013 and quilted Leap Year. I will post pictures of this finish later this week. And finally, I got sucked into the Scrappy Trip-Along craze! So far, I've got 4 blocks made. Not a great picture... I apologize. As I said when I blogged about this Scrappy Trippy thing, I decided to use fabric I wasn't crazy about just to see what the results would look like. I have to say that I'm really enjoying making these blocks. Notice how I put a white strip in the same place for each block? I'm hoping some kind of secondary design is going to appear with these white squares once I've got more blocks done. I'm thinking I might be able to achieve one of my goals with this quilt which is to give at least one quilt to charity this year. And what have you been up to? Are you working on those WIPs? Are you working on your most important goals for this quarter? I'm a maker of lists... to do lists... grocery lists... meal lists... shopping lists... goal lists. Lists help me stay on track, they keep me motivated (gotta love those checkmarks!) and they keep me focused on the most important. I use lists at home, I use them at work so it's no surprise that I also use them for my quilting projects. I already posted about my one goal for January when I signed up for the Lovely Year of Finishes, but I thought I could also take advantage of the 2013 Finish-Along with Leanne at she can quilt. 1. Quilt Leap Year - this was the June Schnibble in 2012 and is the only Schnibble I didn't get quilted. 2. 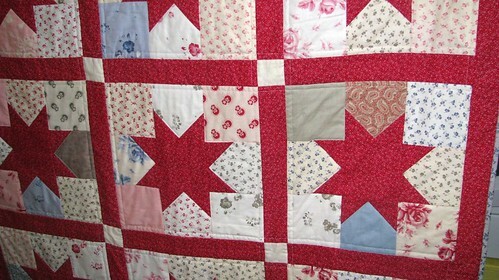 Quilt Charming Stars - my sweet daughter-in-law asked me over the holidays if she would be getting a quilt this year. I said yes of course and then decided Charming Stars would be perfect for her. 4. Quilt The Big EZ - This will probably end up being the new quilt on my bed in the city. I have the backing fabric ready, I have the batting. So all that's left is to baste and quilt and bind. I'm sure I'll be working on a few other projects, but the above 4 will be my main focus this quarter. What about you? Do you make lists? 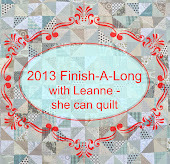 Linking up at Leanne's at she can quilt for the 2013 Finish-Along. 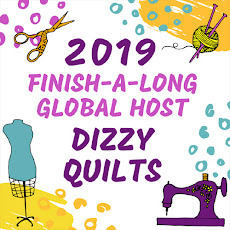 I've been busy catching up on the Fat Quarter Shop's Designer Mystery BOMs these last few days and now that I'm all caught up, I am determined to stay on track! First, I promised you pictures of the completed 2010 BOM top. Here it is. My sweetie was having a really hard time being a good quilt rack! I have to say I am in love with the borders on this quilt. These stars took a while to get done, but they are so worth the extra effort. 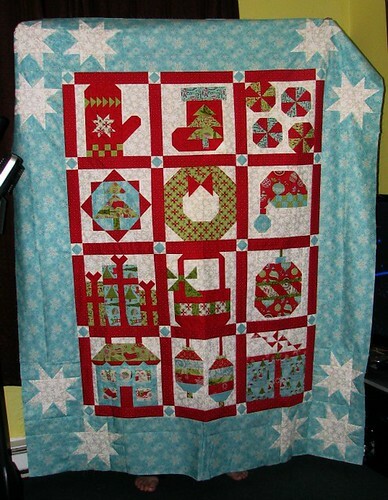 I am really looking forward to having this quilt in the family room during the next holiday season! I also fell behind with the 2012 BOM with all of the holiday quilting and the new baby quilt I had to finish. So this weekend, I decided to put together the 2 blocks I never had a chance to complete. Here is block number 6 - Town Square. This block was designed by Kate Spain (www.KateSpain.com). And here is block number 7 - Moonlight Serenade - designed by Sandy Gervais (www.piecesfrommyheart.net). If you are interested in the Fat Quarter Shop's Designer Mystery BOM, their 2013 program is now available for you to sign up. Besides the fabulous designs, the wonderful fabric and the incredible service you get from the folks at FQS, the absolute best thing about these BOM programs is the fact that you get enough fabric each month to complete the block AND have a huge pile of leftovers when you're done! 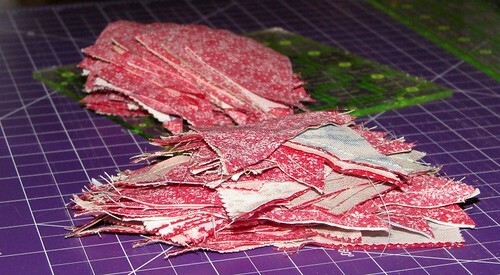 I have bins full of these scraps and some of them are at least as big as a fat quarter! Thank you for visiting and I hope you have a fantastic week! Linking up at the wonderful Sinta's for BOM Rehab. I really tried to resist! How about you? Were you able to resist? I finished the top of the 2010 FQS Designer Mystery BOM quilt yesterday (photos to come in a later post) and after giving it a good pressing, I folded it neatly and put it away until I am able to prepare the backing and start quilting. 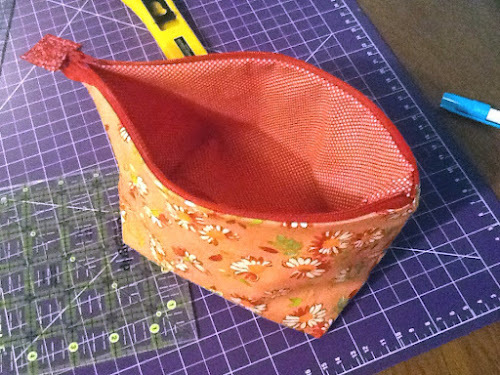 I wasn't really in the mood for another big project and then I came across a blog post by Anna at Noodlehead who made the cutest little zipper pouches in the world! 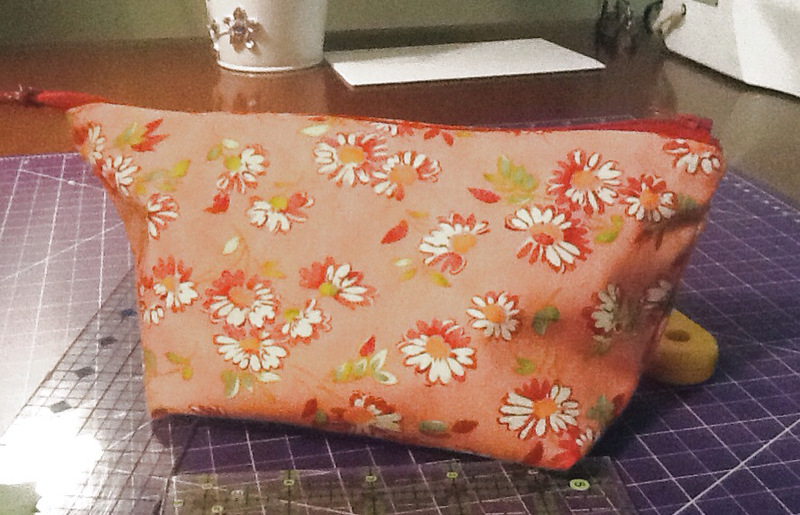 I thought these pouches would be perfect for my girls as makeup pouches so I got to work. I pulled out fat quarters I won a while ago from the Fat Quarter Shop (Ruby by Bonnie and Camille for Moda) and within the hour, I had 2 complete zipper pouches! And here is the 2nd pouch. The zipper was a lot easier the second time around and no fingers were injured in the making of this pouch! 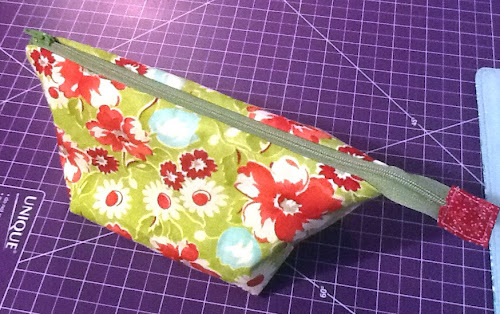 If you are looking for a super fast, easy and cute pouch for a gift or for yourself, I highly recommend this tutorial. The instructions are crystal clear and the results are fabulous. Linking up at AmandaJean's for Finish It Up Friday! Thank you for visiting and have a wonderful weekend everyone! 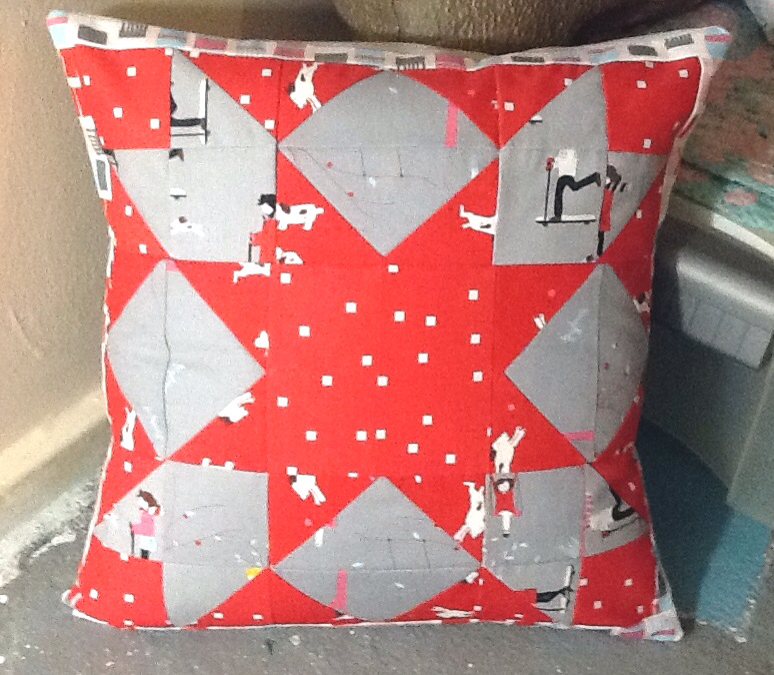 I also completed another pillow - I blogged about that one here. And since 2013 is going to be a year of finishes, I went searching for my oldest UFO and found one that wasn't even listed in my sidebar (I added it yesterday) - the 2010 Fat Quarter Shop Mystery Designer BOM. 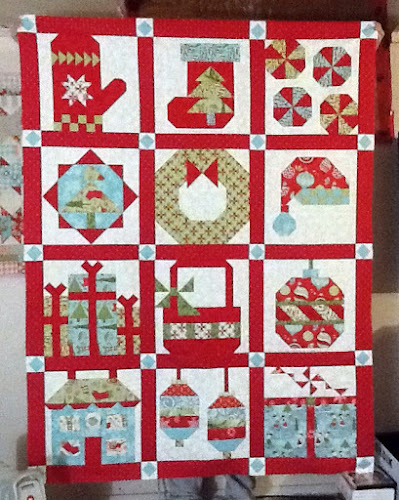 Back in August, I finished piecing all the blocks and was determined to finish the whole thing before Christmas (because it is a Christmas themed quilt), but somehow, the blocks just ended up in their little bin again. So a couple of days ago, I got the blocks out and opened the finishing kit. I'm proud to say the centre of the quilt is now done! My 1st Project of 2013! Right before Christmas, I finished my Carpenter Star pillow and loved making it so much, I decided to put together another block from the same book and make one more pillow. 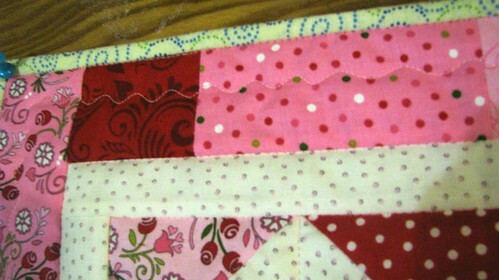 I used the red strips from the Sherbet Pips jelly roll I had and I really like it! The block is called Love in the Mist and I got the directions for putting it together in a sampler book by Nicky and Pam Lintott. And here are all 3 pillows I made these last few weeks. Love in the Mist, Carpenter Star and the November Schnibble, Drop. I am now out of pillow forms so I need to get to the store and get more. These pillows are totally addictive! Before I get started on more pillows though, I said in yesterday's post that 2013 was going to be a year of finishes for me. I've got a pretty big pile of tops that need to be quilted and I am determined to turn them all i to finished quilts this year. To help me stay on track, I decided to participate in A Lovely Year of Finishes hosted by Shanna at Fiber of all Sorts and Melissa at Sew BitterSweet Designs. For January, my one finish is going to be Leap Year which was the June 2012 Schnibble. I've got the backing all ready, so all that's left to do is quilt and bind it. Happy New Year everyone! I hope 2013 is good to you.